A great and rare chance to enjoy Noh lecture and performance! Go straight on 山手通り Yamanote street (walk on the right side), passing Familymart, Seven-Eleven...and keep walking near LION building. Turn right at the corner of 佐川急便 Sagawa Express (also see a coin parking) after passing Mexican restaurant. It takes for 8-10 minutes from the station. Turn left after coming out of Exit 2 on the ground, you will see the Nakano sakaue intersection, and head for Seven Eleven. Go straight on 山手通り Yamanote street (walk on the left side), pass 区民センター Kumin center and walk across 宮下 Miyashita intersection. 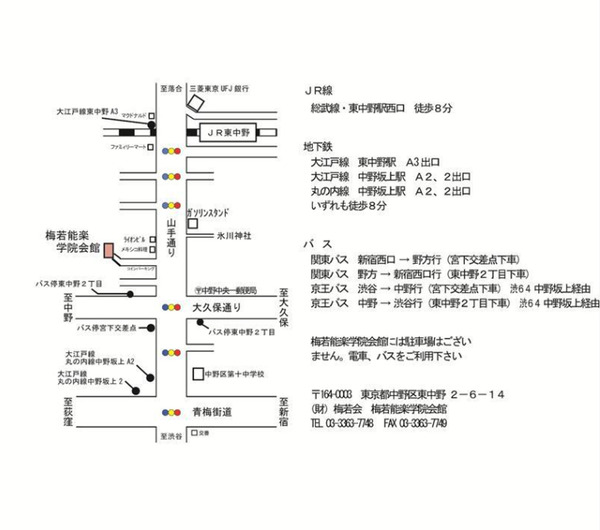 Pass the first roads and then turn left at the corner of 佐川急便 Sagawa Express (also see a coin parking). It takes for 8-10 minutes from the station.